Just get a HEAT LAMP and your hands will tell you the most accurate reading! we did test with our Lexen carbon film VS LLumar ATC VS SunTek Carbon. our film rejects the most heat! SunTek Carbon seems like normal Dyed film, but they call it Carbon? Because ATC is dyed film and they have almost same terrible heat rejection. because it is dyed film. 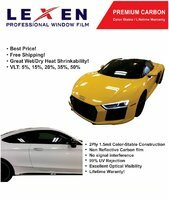 Professional Tint Price Menu on screen! GO DIGITAL! Kinds of Heat lamp box you must have if you sell Ceramic film! Have you ever wonder how PPF patterns are made from? Here is the secret! Do you see many little sensors on Ferrari? Stratos is like double layer of Ceramic film therefore it is a little bit thicker than most 2ply ceramic film. (Pinnacle plus) but shrinks like any other film. 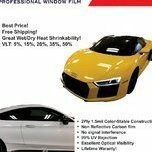 Stratos rejects lots of heat and best supreme line of ceramic film in the film industry. I have nothing to say about the Stratos film price. Very Nice! I can't wait to put them on my upcoming new car! Medium Smoke headlights on Mustang!